You know what I love most about being a teacher? I love those moments when my primary students greet me with a great big smile, followed by sneezing and perhaps a cough or two. Of course, I'm kidding around with that last pair of references. But seriously, it's like that Robert Munsch book where, in kindergarten, we share... we share EVERYthing! And yes, we even share germs. The daily routine of reminding my younger students to wash their hands after sneezing or blowing their nose is a good way to help prevent the spread of germs but the reality is that it is next to impossible to avoid. In any given week, it seems that at least one of the nearly 200 students I teach is sick and I just know that, sooner or later, it will be my turn. And with two kids of my own, I know all too well that they will surely catch one of those nasty bugs, too. Luckily, our family has a fresh stock of our favourite homeopathic cough, cold and flu remedies from Boiron. Ever since my daughter was a baby, we have used a variety of Boiron's products ranging from Camilia to help sooth teething symptoms and Quiétude to help ease restlessness at night, to Boiron's cough and cold remedies. We have been using these products for roughly eight years and still use them today. 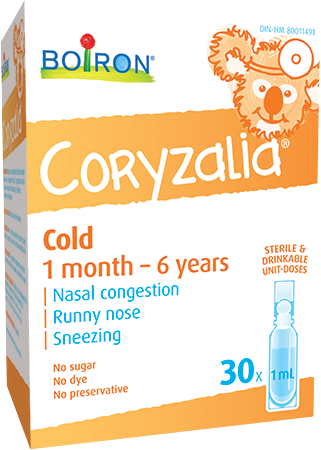 Coryzalia is our go-to remedy when the kids develop systems such as nasal congestion, runny nose or sneezing. I find that using the product at the very onset of these symptoms proves to be much more effective than waiting until they are full blown. Plus, I have noticed it has a very long shelf life so I don't have to worry about them expiring if I don't use all of the 30 doses included in each package. And it is safe for use in children under the age of six. 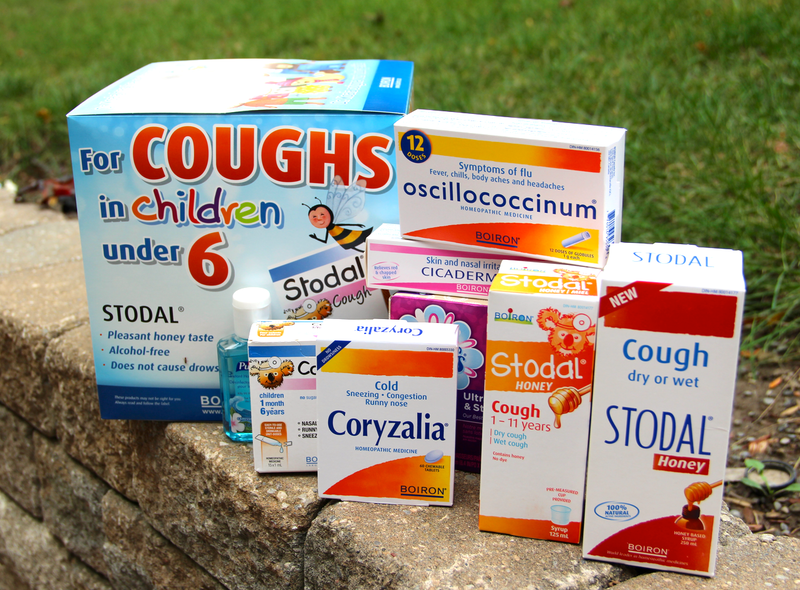 For coughs, we often use Stodal cough syrup. There are now two varieties available: Stodal Honey and the new Stodal Sugar-Free. The sugar-free syrup has a neutral taste but my daughter loves the honey variety. Just like Coryzalia, it has no side effects and there is no risk of overdose. Each package includes a pre-measured cup and you only need to administer 5 ml three times a day and gradually reduce the dosage with improvement. Children's Stodal is suitable for kids between the ages of 1 and 11 years. The adult variety has three additional ingredients but can still be administered to children. The only other difference is a dosage of 15 ml for those age 12 and older. When flu symptoms appear, we sometimes use Oscillococcinum to help relieve chills and body aches. One tube is a single dose, the contents of which need to be dissolved in the mouth. Dosage depends on how early on it is being administered or on the instructions given by your health care practitioner. Boiron also makes Sinusalia which helps relieve nasal congestion and pain due to sinus inflammation. They also make a tablet version of Coryzalia which is suitable for all members of the family as young as five. If you'd like to try products by Boiron, head on over to Boiron Canada's Facebook page for a contest that involves parents sharing their stories about treating kids’ cough, cold and flu. A question or topic is posted each Monday and comments entered before 5pm EST each Thursday will be entered for a chance to win a basket of Boiron medicines. Also check out their contest tab for a chance to win gift cards for Babies "R" Us and Shoppers Drugmart (which happens to be where I buy Boiron products). Disclosure: Our family received product samples to help facilitate this review. Any opinions expressed in this post are our own. I hear you. Sometimes I wish I could wear a facemask and rubber gloves all day. But I would scare the students. LOL It's hard not to get the heebie jeebies when you think of how many times they cough into their hands or rub their nose with their hands and then touch other commonly used objects in the classroom, such as the door handle. Eep! Oh I feel so sorry for teachers and all the germs and virus' their subjected to! These look like great products. My sister is a EA and always is bringing a germ home that she picked up from the kids. I try to have them on hand all the time since they're very effective at the onset when symptoms first appear. Ah, I'm sure you know all too well! Yes, we used Camilia when both our kids were teething and it was a relief to know that it was a natural remedy. Oh, no. Not fun. I usually buy them at Shoppers so I can rack up Optimum points. Thanks, Judy. It's almost impossible but luckily I have a fresh stash of natural remedies at the ready thanks to Boiron. Good luck keeping the colds away this year! I'm interested in trying more natural cold remedies so thanks! Now that the kids are always at school (and after school program, they want to and get sad if they can't go haha) They bring cold and coughs home all the time. I love these products I always have some Stodal in the cupboard. I get scared when they say you can't give children under 6 cough medicine so this is the next best thing. I would rather use a natural product for my children and hope their bodies fight it off! I am so glad for the move toward safer products, especially for the little ones! I have never heard of this product, but after reading this post, I plan to find it!! My youngest gets it really bad when she is sick! I never heard of this before but I will definitely be checking it out now if we need them! So funny about waiting for that teacher immunity. Mine hasn't come either. 10 years in and still waiting. :) Going to check it out! These sound like great products! I've heard of Boiron products before. Going to tell my daughter about these products for her little one. I know she prefers to use natural remedies. Stodal Cough always helps my family. Never heard of this brand before, will check it out! Thanks for the post! I will have to check out Boiron products. I have not tried them for my son. Thanks! I've been using the kids 0-9 homeopathic medicine, but it doesn't work very well. Will def have to give these products a try.